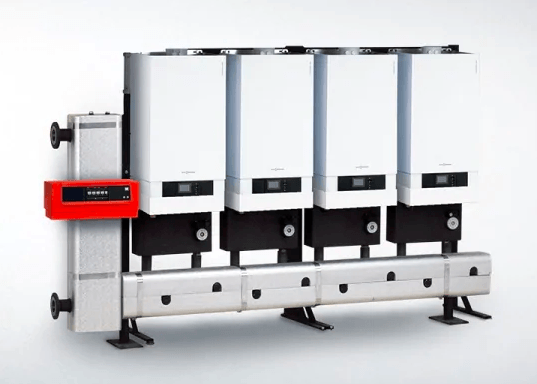 Viessmann commercial boilers are some of the most energy efficient and reliable boilers on the market. Combine that with the 35 years experience of Novel Care and you’ve got a winning combination. Veissmann has been a family owned company since it’s inception in 1917. Veissmann commercial boilers are one of the leading commercial boiler brands in the world and Veissmann is one of the world’s leading manufacturers of commercial boiler technology. When building owners have needed a reliable and energy-efficient heating source for their building, they’ve called Viessmann. Veissmann ensures that the latest technology is being used and ongoing research is at the forefront of all innovation and industry-leading product releases. 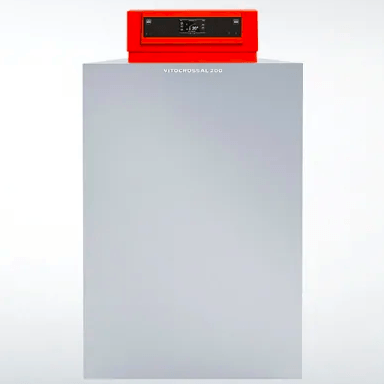 Veissmann commercial boilers have been known to pioneer technology time and time again, setting the standard that exists in the commercial boiler market. 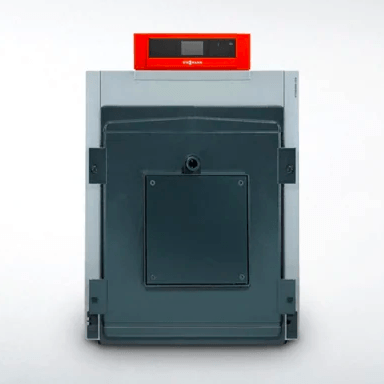 Whether in multi-unit apartment buildings, small commercial buildings or downtown skyscrapers, Viessmann commercial boilers meet every demand and offer solutions for all your needs: oil, gas or wood-fired boilers for both residential use. If you have an HVAC emergency that requires immediate attention we’re available 24/7. Condensing technology offers optimum energy utilization, resulting in maximum savings for you. A gas-fired condensing boiler is one of the most economical and clean ways to generate heat and can significantly reduce your monthly heating bills, as well as your environmental footprint. Outstanding performance with Vitodens 200-W and Lambda Pro combustion management system. Lambda Pro ensures maximum efficiency by automatically adjusting the gas and combustion air ratio. Maximum efficiency with high turndown that precisely matches load. Simplified boiler system layout as manifold and Low-Loss Header provides a complete primary loop. Multiple boilers secure against interruption of heating plant operation. Boilers easily assembled and hydraulically connected prior to installation with a prefabricated manifold. Flexible installation with multiple manifold configurations: wall-mounted, floor standing, corner or back-to-back. Right or left-mount Low-Loss Header acts as a hydraulic brake and helps eliminate air and debris. Ideal for small or difficult-to-access boiler rooms or facilities with narrow halls and stairwells. All serviceable components easily accessible from the front. No pipe or manifold sizing required. Offered in a packaged system. Common venting up to four boilers. 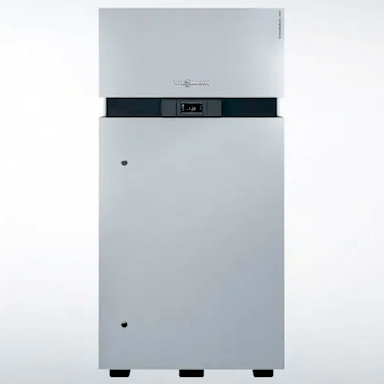 Extremely low NOx emissions and quiet operation from new fully-modulating Viessmann pre-mix cylinder burner. Wide modulation range of 5:1 turndown ratio precisely matches load conditions. 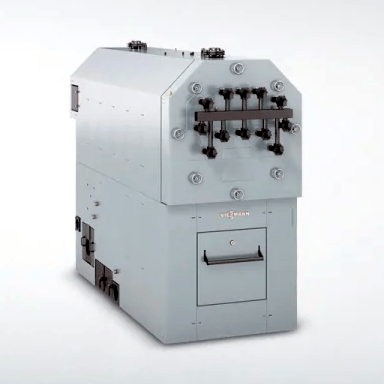 Pre-assembled burner simplifies installation and commissioning. Multiple venting possibilities with installed air intake kit for direct or chimney venting PP(s) or stainless steel up to 198 ft. of vent length. Gas fuel flexibility (NG/LPG/LNG) with a simple electronic conversion. Low inlet gas pressure requirement (NG) as low as 4 inches of water column for compatibility with a range of supply pressures. Large water content extends burner run time and reduces cycling. No dedicated boiler pump required due to extremely low water pressure drop through the heat exchanger – no low-loss header required. Generous stainless steel heat transfer surface area for maximum heat extraction. Seamless integration with building management systems. 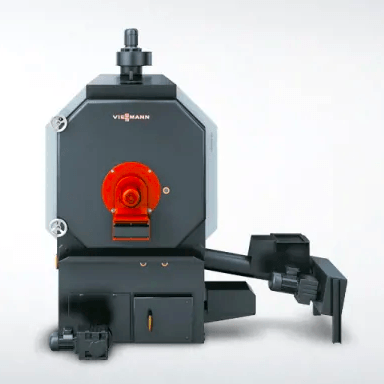 Viessmann cast iron oil boilers have proven Viessmann quality, efficiency and reliable operation. Our cast iron boilers offer a reliable, durable and efficient commercial heating solution. The boiler’s sectional, triple-pass design, combined with a high-quality heat exchanger surface ensures easy installation, economical energy consumption, high operational reliability, and a long service life. Problem-free transport into difficult-to-access boiler rooms thanks to sectional construction and low weight. The Fastfix system facilitates a quick and easy installation. Low environmental impact thanks to low-emission combustion achieved by the boiler’s triple-pass design. Viessmann wood heating systems are modern wood heating systems that provide an environmentally friendly and economical alternative or addition to conventional fossil fuel heating systems. Our advanced biomass systems are fully automated and equipped with control and safety devices for reliable, efficient and safe operation. High efficiency with advanced combustion technology, triple-pass heat exchanger and modulating output control (turndown ratio 4:1). Maximum heat transfer with triple-pass heat exchanger design. High efficiency and ultra-low emissions with precisely controlled primary and secondary air. Automatic ignition device limits idling and save fuel. Low maintenance with fully-automatic deashing, optional pneumatic cleaning system, and flue gas deduster. Advanced safety equipment ensures safe and reliable operation. Custom design of your system by our team of experts. Maximum heat transfer with a triple-pass heat exchanger. Maximum system performance with heavy-duty construction and all system components from one source. Automatic ignition device limits idling and save fuel (optional – only for fuels with >40% moisture content).